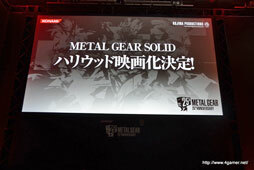 At today's Metal Gear Anniversary event in Tokyo, photos show banners with the slogan "Metal Gear Solid Hollywood Movie", along with the Columbia Pictures logo. Columbia Pictures is, of course, owned by Sony Pictures. 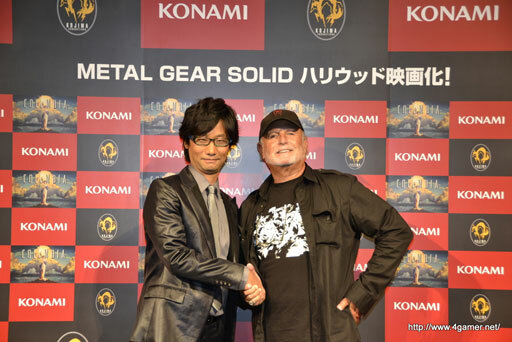 During the stage presentation, Hideo Kojima confirmed that, yes, there was still a Metal Gear movie project in the works with Avi Arad producing. This isn't Arad's first video game adaptation. He's also been attached to the Uncharted and Mass Effect movie versions—movies that have not gotten made. Some of his greatest success, however, has been in bringing Marvel comics to the silver screen. ""Video games are the comic books of today." 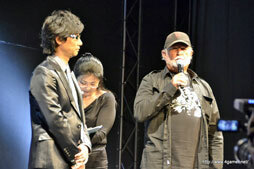 Arad appeared on stage with Kojima, saying, "For many years I fought to bring comics to theaters." "Comic books are now biggest genre in cinema," said Arad. "Video games are the comic books of today." 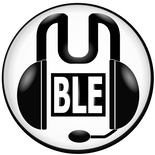 "We will take our time and tell the story with all the nuances, ideology, cautionary tales needed, " Arad added. During the stage presentation, Kojima gushed about some of his favorite films released by Columbia, such as Stand by Me and Taxi Driver. He also rattled off some of his favorite Hollywood actors—folks like Matt Damon, Hugh Jackman, and Ben Affleck. He also said Christopher Nolan was one of his favorite filmmakers. "We'll tell these actors and directors who you want, and maybe they'll do it for nothing," Arad quipped. Arad also said that so many actors in Hollywood would love to play these characters due to the emotional depth they offer. Last edited by Venom on Thu Aug 30, 2012 10:42 am, edited 1 time in total. PostRe: Metal Gear Solid movie announced! It's not possible for this film to be anything but gooseberry fool. And I like the Metal Gear games. I always thought Metal Gear Solid was a movie. But you put it in the wrong folder. How's that thread working out for you? Poncho wrote: It's not possible for this film to be anything but gooseberry fool. And I like the Metal Gear games. Banjo wrote: But you put it in the wrong folder. Like every other gaming film? BID0 wrote: The first MGS game would work really well. Halfway through the movie, Psycho Mantis is going to turn to the audience & make them move to a different screening. There's already a metal gear film. It's called Guns of the Patriots. I think it's quality will depend on if they can get some decent writers on board and a good director. Might end up being one of these projects they announce but never get made. Actually a lot of decent set piece moments for an action flick, as long as it doesnt get too philosophical or pompous and tones down the cyborg ninjas and Crazy psychic baddies it may be plausible. The location is ideal for die hard or escape from new York style film, and shadow Moses would be very cinematic! FatDaz wrote: The location is ideal for die hard or escape from new York style film, and shadow Moses would be very cinematic! I'm thinking the action of The Rock, but more serious, with the intrigue of Crimson Tide. Didn't they already make 4 of these? But seriously, as has been said, if they stick to the first Solid game and stayed away from the more insane aspects of it, it could be quite a decent action movie. Surprised that the game creator didn't mention Kurt Russell as one of his favourite actors or John Carpetner as his favourite director. After all it was them who provided the original Snake P, in Escape from New York/LA. The character must have inspired Big Boss and Solid Snake in terms of style. Must just as well do another Escape film. Wedgie wrote: Must just as well do another Escape film.